Scopia Desktop and Scopia Mobile extends a room system deployment to remote and desktop users over broadband or NextG wireless connectivity (3G and 4G) on Apple iOS and Google Android devices. People can connect to your virtual conference room from anywhere, and can also invite other people to join. The simple web browser plug-in means your meeting can be centrally managed, distributed, and deployed without complex licensing fees or installation issues. Thirty years after it first arrived on the scene, video conferencing is now quickly becoming an everyday part of doing business. Thanks to recent innovations, most companies now see it as a viable means of increasing collaboration and reducing travel costs. And they’re eager to extend its value to desktop and mobile users throughout their networks. Video conferencing technology has been advancing rapidly on two separate fronts in recent years. On one side, large corporations have been investing heavily in state-of-the-art, high-definition ‘telepresence’ installations to enable lifelike, face-to-face discussions between executives. On the other side, we’ve seen the incredible rise of families and friends connecting via free, less sophisticated consumer video offerings like Skype™ and Facetime™. As millions of people have gotten a taste of face-to-face communications, business interest has grown quickly. In fact, most companies now see video conferencing as an ideal way to bring new vitality and speed into their decision-making and business processes. The market is hungry for more affordable, versatile video conferencing solutions that offer the ability to connect with employees, suppliers and customers without compromising security or valuable integrated applications. New technologies with innovative applications are fueling the growth of corporate video conferencing. They’re being driven by a desire to provide a higher degree of communication one that allows businesspeople to do less multitasking in meetings and pick up on highly important non-verbal communication. That desire is coming from all sides of businesses, from management to IT to line of business. Studies show that corporate interest and participation in video conferencing continues to grow. In this paper, we’ve identified seven trends that are fueling corporate interest in adopting video conferencing. able to connect to high-quality mobile video applications on whatever consumer devices they use whether the platform happens to be Windows, Apple or Android. Fortunately, the combination of higher bandwidth capacities, higher powered devices and the ongoing refinement of video conferencing apps have made it possible for companies like Avaya to deliver the goods. And this is one of the most exciting video conferencing trends happening in the market today. Saving money has always been a business motivator. It’s no wonder then that as the costs of video conferencing come down, interest continues to pick up. Technologies that make it easier to transmit higher quality video along with cheaper, high-speed bandwidth have brought down the cost of connecting. Also, as video conferencing technologies mature and scale for broader use, costs per user have come down dramatically. This is especially true with standards-based video systems that enable companies to leverage prior investments in their unified communications systems. As system costs come down, the money companies are able to save by reducing their travel is coming to the forefront. By replacing travel with face-to-face video conferencing, companies not only save money on flights, hotels, local transportation and meals, but can also accelerate their decision-making process and feel good about doing their part to reduce energy consumption and carbon emissions. Video has also proven to be a money-saver in contact centres and other types of service applications in which detailed direction is needed. Fortunately, the days when IT had to be summoned to painstakingly set up each video conference are long gone. Today, a single touch or swipe is often all it takes to connect to co-workers and customers around the world. It’s also easy to provide centralized access to video conferences now by just sending a link to all attendees in an email invite. There’s simply no need to worry about downloading special licensed clients or firewall traversal. All of these things are handled automatically. The impact this simplicity is having on companies can be seen everywhere. And one of the biggest beneficiaries is the recurring conference. Instead of dull, faceless exercises, these regular check-ins can now include a rich visual component with a personal touch. There’s so much more room now for achieving spontaneity, camaraderie and the holy grail of the video conference collaboration. There’s more to a meeting than just conversation. That’s why audio and web conferencing systems are adding video conferencing to the mix. And it’s why leading vendors are busy adding elements of web conferencing into enterprise video conferencing offerings. Today’s new video conferencing features allow participants to check presence, share files, share screens, instant message and even brainstorm on interactive white boards together. The industry is heading toward a unified solution that will blend all of our audio, video and data into a single communications solution that works across any and all end user devices. By integrating video conferencing with UC systems, companies can support all kinds of flexible access scenarios, including both fixed and mobile networks. The possibilities are truly endless for the integration of our communications and the interoperability of our devices. The arrival of Scalable Video Coding (SVC) had made it possible to run high-quality desktop and mobile video over the Internet for an affordable price. SVC divides video frames into separate encapsulated layers containing portions of the entire stream. This helps eliminate interruptions — even on busy networks. It also facilitates multipoint video conferencing sessions in which users log on using a wide range of different hardware or devices all with different bandwidths, processors and speeds. process uses far less computing power and does not require specialized servers. This has helped to bring down video conferencing costs considerably and made it easier for less powerful mobile devices to enjoy full video capability. In the past year or two, video conferencing has come a long way toward meeting the unique demands of businesses. One of the main improvements has come in the IT management of company-wide systems. It’s now easier than ever for companies to add and manage video users on their network, as well as control bandwidth capabilities and resource utilization. The very best solutions available have also managed to tightly integrate desktop and mobile video conferencing within their existing install base of video conferencing systems. These developments are now allowing companies to maintain their investment in room-based systems while extending the scale of their capabilities throughout the company. As a result, the function of video conferencing is extending beyond simply meeting conference requirements to being able to integrate important business processes as well. This has helped to open up a whole host of new possibilities for business in everything from education and healthcare to court hearings and emergency command. Here are some of the key benefits you should look for when shopping for a video conferencing system for your company. by allowing you to create high-quality, easy-to-use voice, video and data collaboration environments, regardless of your communication network IP, SIP, 3G, 4G, H.323, ISDN or next generation IMS. As a result, you’re able to connect instantly with ALL of your co-workers, customers and partners without a hiccup! of scalable video in a mixed video coding world. In other words, you can interoperate with any standards-based endpoint — without the need to scrap existing infrastructure investments or set up dedicated transcoding gateways. The lifelike experience you will enjoy with high-definition video makes the decision to choose HD a no-brainer. Standard video conferencing pales by comparison and makes users think twice before connecting by video. Avaya lets you bring your room system HD experience to almost any device you use. With us, you can participate in standards-based video conferences in which you can clearly see up to 28 participants simultaneously. Based on our video infrastructure, your desktop or mobile device can now connect to HD telepresence systems, standards based HD video conferencing systems and a whole range of unified communications applications for unmatched interoperability. The ability to share different media as you video conference is a huge benefit. Having this feature means you’re not only able to meet face-to-face, but also hand over and review files while you chat. It saves time, speeds decisionmaking, and eliminates email overload and the stress of multitasking. Avaya makes it simple and affordable to share presentations, spreadsheets, documents and images in an engaging video environment. By using Avaya’s advanced data collaboration function, it’s easy for those who join a conference late to review previously shared materials without interrupting the presenter. It’s important to select a system that gives you the ability to run video conferences in an orderly fashion. Not having the ability to control, moderate and control each conference can keep you from achieving your specific meeting goals, or worse, create confusion or chaos during the video conference. 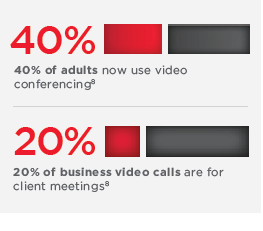 Avaya makes everything about video conferencing simple, including starting the meeting, recording, locking the conference, sharing data or ending the meeting. Avaya even lets you view your participants list and mute noisy users, stop cameras or simply disconnect unwanted participants. Our interface also lets you change video layouts, rearrange participants, or view statistics such as codecs in use, resolution, network speed and network loss. Firewalls have long been a frustration in video conferencing. But disabling firewalls is not an option since this poses security issues with your system. What you need is a solution that addresses this challenge without creating a new one. Avaya has solved the firewall issue, helping you enjoy easy connectivity through enterprise boundaries while still maintaining corporate security with an automatic, embedded firewall and network address translation (NAT) traversal. This keeps your connections simple and your system secure. Requiring users to complete complicated licensing forms prior to joining their first video conference can keep your best players on the sidelines. This is why it’s important to find a system that makes it easy to jump right in. Avaya’s simplified licensing model makes deployment easy for employees, partners, suppliers, customers and even casual users. You simply click on a link, install the browser plug-in and connect — all without complex licensing fees or installation issues. Avaya video conferencing solutions help you improve productivity, take swifter action and provide more responsive service to your customers. By helping you leverage your unified communications and legacy video system investments, we keep your costs down as you extend the benefits of video conferencing throughout your company. As a global leader in video conferencing systems, Avaya enables faster, more effective collaboration both inside and outside your company. We offer scalable video conferencing solutions that provide high-quality audio and video, content sharing, and easy functionality across all your meeting rooms, desktops and mobile devices.